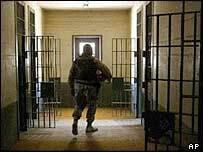 UN human rights experts say they want to visit inmates in US custody in Iraq, Afghanistan and Guantanamo Bay and also terror suspects in other countries. A group of 31 experts issued a rare joint statement on concerns about the effects of some US counter-terrorism measures on human rights worldwide. The move follows a global outcry at the abuse of Iraqi inmates at Abu Ghraib. UK Attorney General Lord Goldsmith said military tribunals set for Guantanamo did not meet international standards. He acknowledged the limitation of some rights for the suspected Taleban and al-Qaeda prisoners held at the US military base in Cuba might be justified. But there could be no compromise on certain principles, including the right to a fair trial, for the inmates who include four Britons, said Lord Goldsmith, the UK government's top legal adviser. US defence officials insisted to the BBC that the planned military commissions would be free and fair and that criticisms would decrease when people saw the tribunals in action. Although the letter from the experts on the Geneva-based UN Commission on Human Rights does not mention the US by name, it will increase the pressure on Washington to be more open about its handling of detainees, correspondents say. But it is unlikely that the UN will get a quick response to its demand for access, the BBC's Imogen Foulkes says. The experts said they were motivated by "a number of recent developments that have alarmed the international community with regard to the status, conditions of detention and treatment of prisoners in specific locations". Our correspondent says that was a reference to the abuse scandal at Abu Ghraib prison in Baghdad where Iraqi prisoners were photographed naked and in humiliating positions. The statement - signed by nearly all UN human rights experts - called for access as soon as possible to prisoners held at US detention centres in Iraq, Afghanistan and Guantanamo Bay in Cuba. The experts said they had a "unanimous desire" to send a team to try to "ascertain... that international human rights standards are properly upheld with regard to these persons". "So this is now a collective demarche in the hope that it will have more effect," Mr van Boven said. Theo van Boven, a UN special rapporteur on torture, told reporters in Geneva that some UN experts had asked to visit detention centres such as Guantanamo before, but no answer had been forthcoming. However, Mr van Boven warned against singling out the US for criticism, stressing that earlier this year he presented to the UN a study detailing alleged torture in 80 countries around the world. "We have to try not to be selective. We should be aware that there are many problems in other places," Mr van Boven said. As an example, he mentioned the troubled Russian republic of Chechnya, where the Russian army fighting rebels is accused of abusing the rights of civilians. "Guantanamo bay is a touchy subject when it comes to Anglo-American relations"